Draughtsman and Surveyors in different departments of the Madhya Pradesh state. Applications form for this Sub Engineer and other jobs will be accepted through online via MPPEB official website of www.peb.mp.gov.in. For this MP Vyapam Recruitment of Sub Engineers, Draughtsman, Tracer and other vacancies online application will be received from 27-07-2018 to 10-August-2018 from the local residents of the state and non local residents. 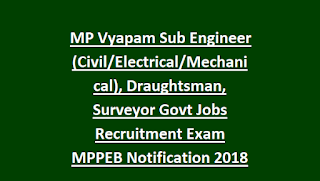 Candidates who are looking for this MP Vyapam Vacancies of Sub Engineer (Mechanical/Electrical/Civil) jobs and who meet the prescribed educational qualifications and other qualifications for these posts, can submit their application to the Department before the last date. For more details of MP Vyapam Sub Engineer, Draughtsman Vacancies exam pattern, post wise vacancies, department/district wise vacancies and more details are given below. 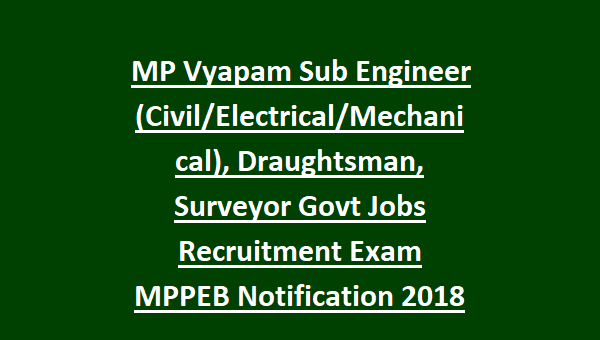 There are total 557 Posts available in this MP Vyapam Recruitment of Sub Engineer, Tracer, Surveyor and Draughtsman, Asst Sub Engineer Jobs. Post Name and available vacancy detils are given below. Sub Engineer-Civil - 383 posts. Sub Engineer-Electrical - 06 posts. Assistant Draughtsman - 00 post. Sub Engineer / Investigator / Quantity Surveyor - 00 post. Sub Engineer Electricals & Electronics - 00 posts. Mineral Surveyor - 00 post. Sub Engineer - Assistant Sub Engineer Civil - 00 posts. Sub Engineer-Mechanical - 00 posts. On this employment information, the pay scale is fixed at 9300-34800 / - (grade pay 3200 / -) for Sub Engineer Jobs and Rs.5200-20200 / - (grade pay 2100/2400/2800 / -) per month for other posts. 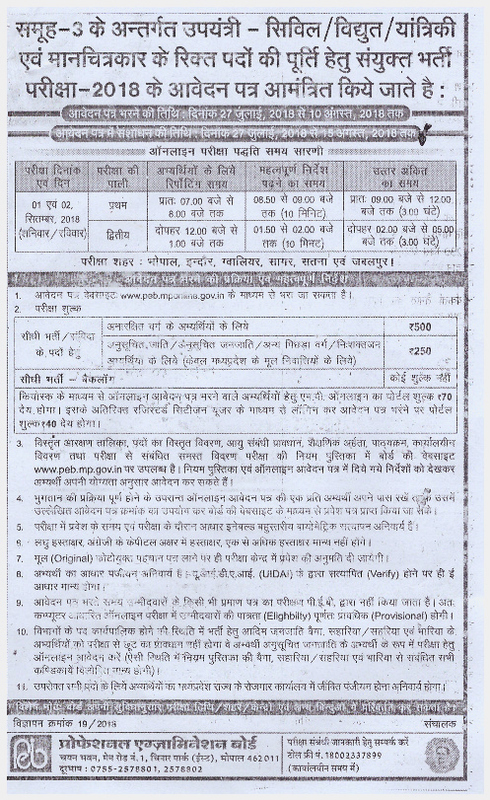 For more information on salary, please visit the MP Vyapam official advertisement. For Sub Engineer Jobs of MP Vyapam candidates should have qualified Engineering Degree/Diploma in Civil/Electrical/Agriculture/Mechanical/Interior Design/Architecture from any recognized university. For Assistant Sub Engineer Jobs candidate should have qualified 3 years diploma in Agriculture or civil Engineering. For more details refer official RuleBook of MPPEB. The candidate's of MP State Male age has been fixed between 18 and 40 years on this employment information. For Female/reserved candidates upper age limit is 45 years. General Category - 500 / - and for SC / ST / OBC / PH - Rs. 250 / - and charges separately. Grade 3 Jobs Selection will be held through written examination only. Written Exam will be conducted for 200 Marks. 100 Marks questions will be asked from respective subject knowledge. And another 100 Marks questions will be asked from the topics of General Hindi, General English, General Knowledge, Basic Maths, General Intelligence, General Science and General Computer Knowledge. The candidates will have to apply online for this employment through MP Vyapam Official website of www.vyapam.nic.in and last date for submission of application form for this MPPEB recruitment is 10-08-2018.